At Simon Berry Optometrists we pride ourselves in providing the best service to all. One way of doing this is by making reasonable adjustments to the way we work and tailoring our service to meet the needs of our patients. We can also offer a more bespoke service to those with disabilities or who may require additional assistance with their eye test. If you are a person with a disability and would like to book an eye test, you may find it helpful to download our ‘Telling the optometrist’ form (below). This is a document produced by the charity SeeAbility. Before attending your eye test please send us the completed form and this will help us to understand your needs to provide you with the best possible service we can. Our premises are wheelchair user friendly with nearby street parking and easy access to our testing rooms. 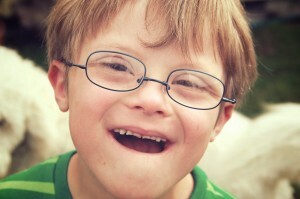 We also offer specialist frames for children with Downs Syndrome. Erin’s World™ frames are specially designed to fit children with Down syndrome. Unlike other frames, the bridge is adjusted to fit on their smaller noses and the arms are designed to help keep the glasses from slipping. Erin’s World frames are available in a variety of sizes to fit toddlers to adults. This is the form for you and your supporters to download and fill in before your eye test. Fill in this form and send it back to us, either by post or email. This will help the optician understand your needs. Using this form will help you get the most from your eye test. This factsheet tells you what will happen at an eye test. It gives you advice about how to get ready for an eye test. It gives you information about why eye tests are important.